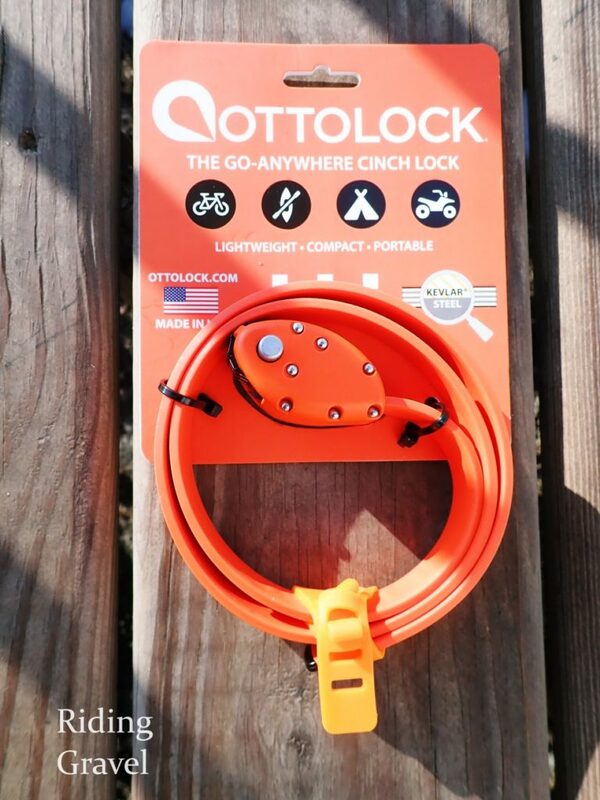 OTTOLOCK Cinch Lock: Quick Review- by Guitar Ted I know that uneasy feeling when I park my bike outside the coffee shop after a ride is going to come over me. I cannot help but be worried about my bike leaning up against the railing…….. out there. Unprotected. Unlocked. I try to keep an eye on it, but…. “Man! If I only had a small, lightweight, easy to pack, effective deterrent to potential thieves.” Well, you’d think the OTTOLOCK folks had perhaps read my mind, because here is something that fits all my criteria for a lock that makes me feel at ease during my after-the-ride beverage and snack time with my friends. 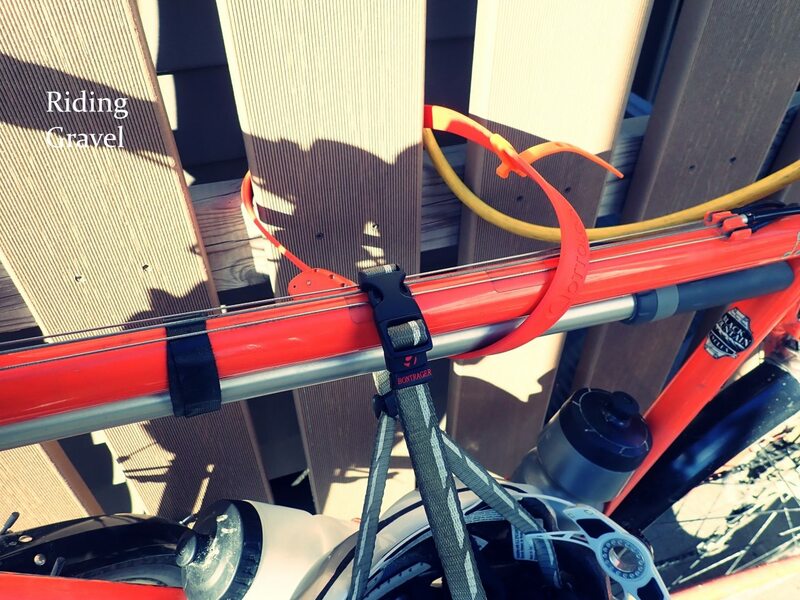 The OTTOLOCK cinch style lock can be thought of as a sort of high tech zip tie. 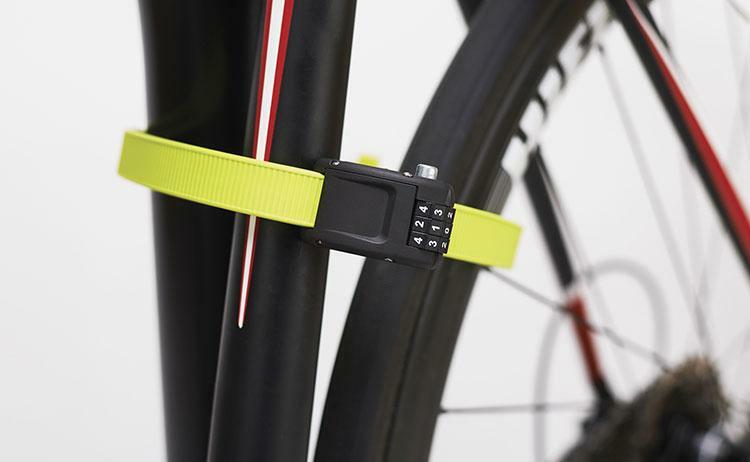 What It Is: The OTTOLOCK is a security device that provides the cyclist a way to be able to leave their bike for short periods of time without worry of thievery. It could probably be best compared to a cable lock, but it really isn’t that. The band which makes up the length of the lock is serrated on one side, much like a zip tie, and smooth on the other. Beneath its rubbery coating are three stainless steel layers and four reinforced Kevlar layers. The locking mechanism is aluminum with three circular dials which are numbered on their outer edge. There is a silver button on the side of locking head which releases the mechanism’s hold on the serrated band so you can slide it in or out of the head. This button is also vital in the combination setting process. By the way, the combination can be reset at anytime. OTTOLOCK comes in three lengths, 18″, 30″ and 60″. 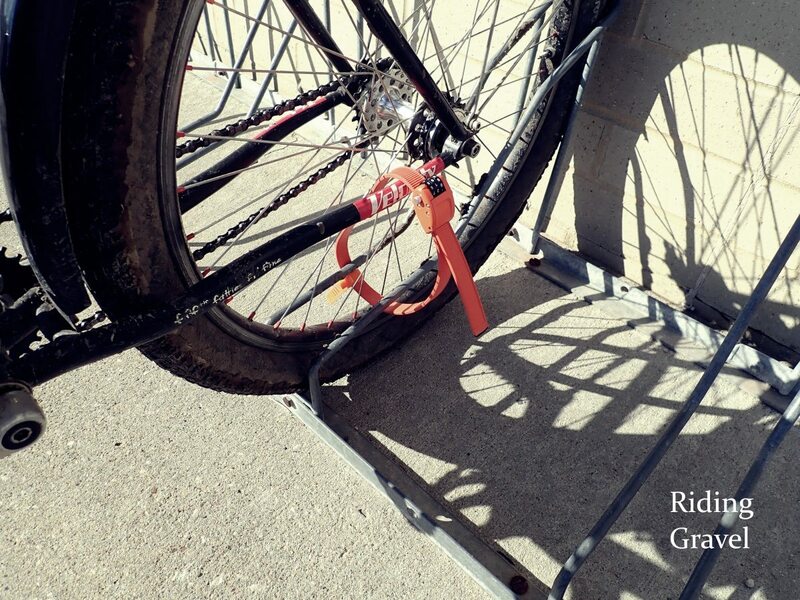 RidingGravel.com received the 30″ version to try out. Prices range from $55.00USD for the 18″ size to $65.00USD for the 30″er, and $75.00USD for the 60″er. The OTTOLOCK comes in three colors- Black, Orange, and Lime Green. The 30″ OTTOLOCK sample we have weighs in at 152 grams, so it is pretty light, and the band is quite flexible, so it is easily stowed in a bag, jersey pocket, or hydration pack. I found that the OTTOLOCK was easy to thread through this fencing and attach around my top tube. How Did It Work? The OTTOLOCK can be wrapped up into a circle that is about the same circumference as a softball, but it also can be squeezed down into an oval shape, so I stuffed it into a seat pack and a front bag on two different bikes rather easily. Carrying it around is no big deal, since it is so light. While you could stick it into a jersey pocket, I didn’t because I am still wearing wool jerseys at this time of year and I didn’t want to stretch the pockets out or fight with the rubbery coating against the wool. At any rate, it is easily stowed and isn’t a bother at all. I followed the simple instructions to set my own combination and then I fiddled with the band sliding it in and out of the head. It really needs a firm tug to get undone, but sliding it together is easier. The button on the lock head should be depressed to release or insert the band, by the way, although I managed to pull it out with the combination set to “open” once. Obviously, you wouldn’t leave the lock in this state, but I was a bit surprised that I could do that. The 30″ length was the Goldilocks length for how I would want to use this lock. It isn’t so long that it becomes bulky when coiled up, or so long you have to cinch it way up. The 30″ length gets the job done on most bike racks or objects that you can secure your bike to and it should make it really tough on thieves. Any shorter though and I wouldn’t be able to get my bike locked to things conveniently, or at all. Here I locked my fixed gear commuter to this rack and went in to a local grocery store for about 20 minutes. This, or any security device that is used for bicycles, can be defeated, I am certain of that, but given the right situations, I think this device is perfectly suited. OTTOLOCK says it is more secure than a cable lock and not quite as secure as a “U” lock. Somewhere in between, I guess. But that’s “just right” for those convenience store stops, for running into a shop for a second or two, or even as a secondary security lock for your bicycle when it is on a car rack. At The Finish: The OTTOLOCK is made in the USA and features a great design that seems to be a good choice for those times when your friends want to get a cuppa joe, or for securing a bicycle to a car rack, or perhaps as a device to secure your bike inside a garage or apartment to discourage thieves. It has an easy to use combination lock, and that combination can be changed as many times as you want. The design, which to my mind is much like a zip tie, works very well. While it comes in three lengths, the 30″ length seems well suited for the touring cyclist or gravel rider that needs some peace of mind at night or for those pit stops on the road. I know that now I can go have that coffee and a cookie to dunk in it whenever I am out with the group without getting the heebie-jeebies wondering if someone is going to ride off with my bike. That’s a better feeling than I have experienced without the portable, lightweight, and seemingly effective OTTOLOCK. See more about the OTTOLOCK, including videos about it, on their webpage: www.ottodesignworks.com Note: RidingGravel.com was sent the OTTOLOCK Cinch Lock by OTTO Design Works at no charge for test and review. We were not paid nor bribed for this review and we strive to give our honest thoughts and opinions throughout. Yeah i had one of these and locked my bike up in front of a Safeway was gone 10 minutes . Never again 7 grand gone . I bought the 30″ version in 2017 to use during solo road bike rides just to prevent someone from simply walking away with the bike. It worked fine for that intended purpose until after about a year of use, the rubbery/plasticky outer layer wore off at the end of the strap, exposing the sharp-cornered metal core that would rip through jersey pockets or bags and rendering the lock unusable. I’ve read that the new version of the lock has a reinforced tip but I have not read any long-term reviews yet. I’ve written to the company regarding my negative experience with the lock but they didn’t even bother to respond. Also, this lock can be cut in one second with a $10 tool that can be bought at any hardware store.